NS Recipe supports fine-grained permissions: access, view mode, edit mode, edit self items, delete self-items... Discover what NS Recipe is capable of. 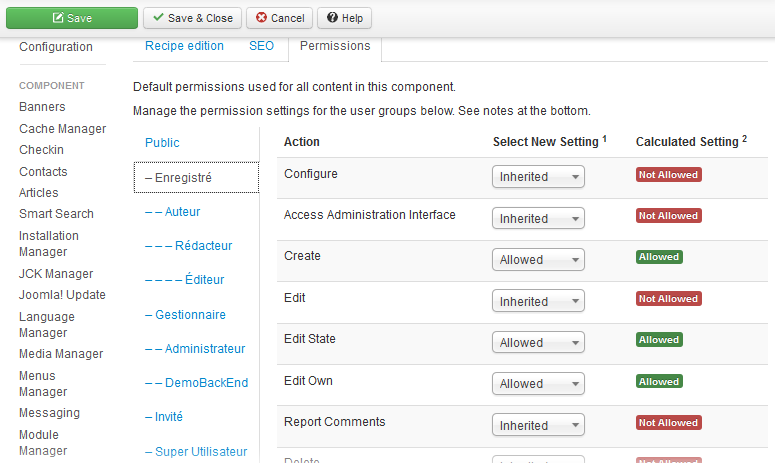 IMPORTANT Permissions configuration is MANDATORY if you plan to use the front-end recipe submission feature. NS recipe uses native Joomla Permissions System. Allow Users of group to edit NS Recipe Options. Allow Users of group to access administration interface. Allow Users of group to Create recipes. Allow Users of group to modify ANY recipe. Allow Users of group to modify recipe status (published, validated, and featured). Allow Users of group to modify recipes they created. Allow Users of group to Report Comments. Allow Users of group to Delete ANY recipe. Allow Users of group to delete recipes they created.